Students work in an area of specialization (their major program), which they choose based on their own motivation and interests. Students develop their overall academic abilities by focusing on two main areas: a primary and secondary major. In the secondary major, students pursue a practical trans-disciplinary program in global and regional human development that helps them to develop their capacity to contribute to society. 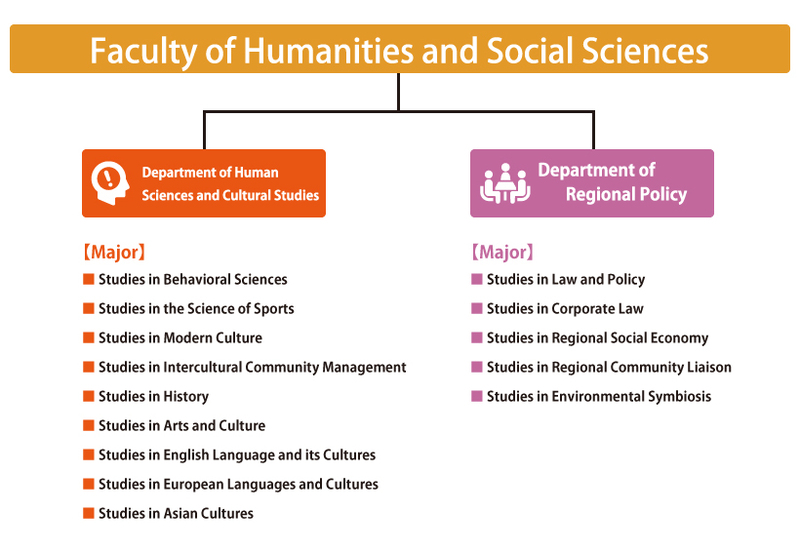 As a result of the abolition of the Faculty of Education’s lifetime education program and its arts and culture program, we have newly incorporated studies in sports science and in arts and culture within the human culture course, and we have worked to enhance our comprehensive education capabilities. We are working to address the physical, psychological, and cultural problems of people in regional communities. We aim to develop a comprehensive understanding based on the various fields of behavioral science, sports science, cultural science, and arts and culture. We are working to create a sustainable society following post-earthquake reconstruction. We aim to gain an advanced and comprehensive understanding of law, economics, and environmental studies so as to nurture individuals to address regional development from a comprehensive and global perspective. Cannot be selected as the primary major program. Based on the expertise that corresponds to the course with which the individual students are affiliated and taking advantage of the global perspective and practical abilities that our students acquire overseas, we develop their willingness and motivation to contribute toward solving various regional problems, including social, cultural, and environmental issues.